Players must carefully weave their pieces past each other to Home (the opposite corner). A traffic jam will lose the game for everyone. Tactics involve self-sacrifice, luck of the dice and cleverness in using the opportunities that Chance provides. The game has the 'feel' of backgammon. For younger players, set it up with fewer pieces. For serious strategists, the game can be recorded as you delve into the intricate world of openings, and mid and endgame tactics. 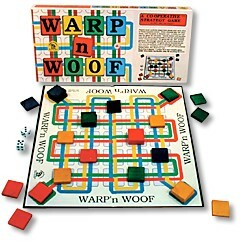 Includes: 12 x 12" board, 4 sets of colored wooden pieces, dice, illustrated rules.